CITIC Securities Co, the largest listed domestic brokerage, and its subsidiary have topped the list of brokers earning underwriting fees for the first batch of stock listings on the NASDAQ-style growth enterprises board (GEB), which is to be officially launched today. CITIC, together with CITIC China Securities, in which the former holds a 60-percent stake, have earned underwriting fees worth 188.97 million yuan in three initial public offerings (IPOs). The two brokers' combined underwriting commission accounted for 26.3 percent of the total made by all the 23 domestic broker participants, with Beijing Ultrapower's 166.97 million yuan underwriting fee earned by CITIC Securities ranked at the top. The brokerage firm and its subsidiary have underwritten issues for software developer Beijing Ultrapower, Shenyang-based SIASUN Robot & Automation, and filmmaker Huayi Brothers. The first batch of 28 companies, which are to be listed on the GEB based in Shenzhen on Oct 30, have raised around 15.5 billion yuan ($2.27 billion) in their IPOs, according to Yao Gang, vice-chairman of the China Securities Regulatory Commission. 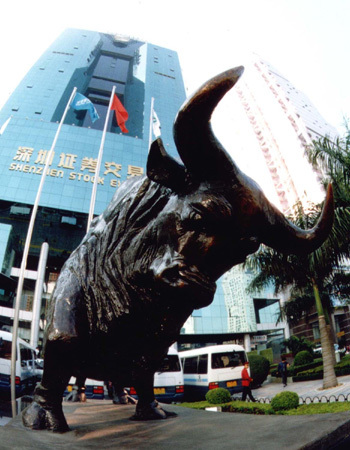 "Large brokerage firms like CITIC Securities have more star underwriters with extensive expertise and good reputation. Therefore, their smaller peers find it hard to compete with them in bargaining with IPO firms," said Liu Zhiteng, an investment manager at investment consulting firm Blue Ocean Capital. According to figures compiled by 21st Century Business Herald, the average underwriting commission rate for the 28 cases was 4.83 percent, higher than the small- and medium-sized board's 3 percent and 2 percent on Shanghai's main board. CITIC Securities' underwriting fee for Beijing Ultrapower was 6.6 percent. Changjiang Securities estimated that 50 firms were likely to be listed on the new board, raising a combined 22.5 billion yuan within the year, which will generate 1.58 billion yuan worth of underwriting fees for securities firms. The aggregate amount of capital raised by the 28 firms to be listed on the GEB only accounted for the volume of a medium-sized firm on the main board, Yao said. "The underwriting market for big IPOs, which can generate more revenue for securities firms, have been dominated for long by large brokers," said Liu, adding that these firms' willingness to vie for business on the GEB, therefore, were not strong enough. Medium- to small-sized brokers in the coastal area, which has been the cradle for start-ups, are expected to emerge as major underwriters for growth enterprises due to their geographic proximity, said Lin Feng, an investment manager at Guojin Wealth Management Center. Lin said that Shenzhen-based Guosen Securities, China Merchants Securities, Guangzhou-based GF Securities, and Nanjing-based Huatai Securities were expected to take the lead in investment banking business for GEB-listed enterprises.